Are you a Sudoku Master? The puzzle craze that's sweeping the nation comes to the Nintendo DS! Once you've played Sudoku Gridmaster, you'll never go back to pen and paper again. * Touch and go! Sudoku Gridmaster's intuitive Touch Screen controls make solving the puzzles faster and easier than ever. * A world of challenges! 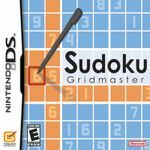 Sudoku Gridmaster features over 400 sudoku puzzles, all of which were handpicked by the sudoku masters at Nikoli - the original creators of sudoku. * Featuring four difficulty settings, plenty of helpful hints, and a challenging ranking system, Sudoku Gridmaster has puzzles for all skill levels.